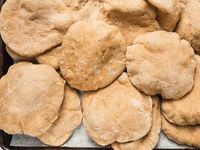 Similar to pita, but made with whole wheat flour, this Egyptian flatbread is traditionally baked in scorching-hot ovens in Cairo's bustling markets. Home cooks can achieve similar results with a baking stone and an oven cranked to high. Similar to pita, but made with whole wheat flour, this Egyptian flatbread is traditionally baked in scorching-hot ovens in Cairo's bustling markets. In a large bowl, whisk the yeast with the water and let stand until foamy, 10 minutes. Add 2 1⁄2 cups of the whole-wheat flour and stir until smooth. Cover the dough with plastic wrap and let stand for 30 minutes. Uncover the dough and, using your hand, stir the salt and oil into the dough and then add the remaining 2 1⁄2 cups whole-wheat flour and mix until the dough comes together. Scrape the dough onto a lightly floured work surface and knead until smooth and elastic, about 10 minutes. Place the dough in a large bowl greased with oil and cover with plastic wrap. Let stand until doubled in size, about 1 1⁄2 hours. Place a baking stone on a rack in the oven and heat the oven to 500° for 30 minutes. Meanwhile, punch the dough down and divide into 16 equal pieces. Roll each piece into a ball and then flatten into a 5-inch circle. Lightly sprinkle the cracked wheat bran, if using, or more whole-wheat flour over 2 parchment paper-lined baking sheets. Divide the dough circles between the baking sheets and loosely cover with a kitchen towel. Let stand until slightly puffed, about 30 minutes. Working in batches, place the dough circles on the hot baking stone, spaced 2 inches apart, and bake until puffed and lightly charred in spots, 6 to 8 minutes. Transfer the breads to a rack and let cool for 5 minutes before serving. Andrea Nguyen's formula means endless variation on banh mi, from sausage and pâté to grilled chicken and avocado. The iconic banh mi—complete with homemade pickles, paté, and pork sausage—is easier to make thank you think. Julienned carrots and daikon in a salty-sweet vinegar brine is the perfect quick condiment for grilled meat, sandwiches, or classic Vietnamese banh mi. This riff on the classic banh mi swaps the usual cold cuts for fatty Chinese-style grilled pork and a layer of cooling cucumber. Juicy flame-kissed chicken thighs are teamed with creamy avocado, fiery jalapeño, tangy Vietnamese pickles, and plenty of fresh mint in this colorful banh mi. From Maynards wine gums to ketchup chips and Hawkins’ Cheezies, these beloved Canadian snack foods have yet to make themselves available in the United States. In this Japanese-inspired weeknight dinner, springy udon noodles are tossed with a light yet flavorful curry sauce and rounded out with beef and vegetables. A delicious homemade version of instant Japanese curry, this saucy, slightly sweet meat-and-vegetable stew is the perfect partner for springy udon noodles. At Saveur, we recommend all kinds of products we think you'll love. In some cases, we receive a commission for purchases made through this site, but if a product link shows up in an editorial article, it's there for one reason: We love it. End of story. Copyright © 2019 SAVEUR. A Bonnier Corporation Company. All rights reserved. Reproduction in whole or in part without permission is prohibited.